Matthew Desmond’s “Evicted” opens with an anecdote and an allegory: a boy stands on his street corner and throws a snowball at a car. The car stops, and its driver chases the child, Jori*, into his home, kicking down the door when the boy locks it behind him. The small snowball careens out of control and becomes an avalanche: Frustrated by the broken door, the landlord kicks Jori and his family (mother Arleen, little brother Jafaris) out of their apartment, and they live at a homeless shelter for the remainder of the snowy Milwaukee winter. When Arleen eventually finds them a new apartment, it is condemned within a month. Arleen, Jori, and Jafaris, one of eight families chronicled in Desmond’s book, will spend the next few years bouncing around unstable housing situations in Milwaukee. Desmond cites many sobering statistics, which evince his point that the housing crisis is a matter of national urgency; but the book’s real strength lies in its ‘characters.’ The tenants’ stories put a human face on a crisis that is often discussed in terms of large-scale policy. 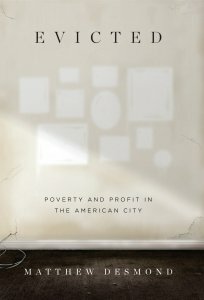 An article published July 27th, 2018 in The New York Times begins by admitting that, “Millions of low-income Americans are paying 70% or more of their incomes for shelter, while rents continue to rise and construction of affordable rental apartments lags far behind the need,” but spends the majority of the article explaining incongruous actions and statements from Secretary of Housing and Urban Development Ben Carson. Conversely, Desmond’s book details the daily realities of tenants who pay 70% or more of their monthly income to retain housing in sub-standard conditions. When Arleen, Jori, and Jafaris move into landlord Sherrena Tarver’s two-bedroom unit after their previous apartment is condemned by the city, Arleen calculates that the rent will take 88% of her $628 a month welfare check. Still, she reasons, she can make it work. But after an unforeseeable event, in this case, the death of Arleen’s sister and subsequent funeral costs, Arleen falls behind on rent and Sherrena initiates the eviction process. It is a testament to Desmond’s even, balanced storytelling that the landlords profiled in “Evicted,” Sherrena Tarver and Tobin Charney, don’t come off as totally irredeemable tools of capitalist greed. Much of Desmond’s field work involved him playing the role of Sherrena’s “assistant”: Desmond shadows Sherrena for years as she drives around the North Side of Milwaukee in her husband’s Chevy Suburban, performing various landlordly duties. Desmond describes these outings with the same cool detachment whether Sherrena is showing up on Arleen’s doorstep with bags of free groceries for Arleen’s family, or handing an eviction notice to Lamar. Lamar, a man who has no legs below the knee, nevertheless makes a colossal effort to assist Sherrena with home-improvement tasks for his unit, hoping she will credit him some money towards his rent and stave off the dreaded eviction notice. Both Tobin, the owner of a 131-unit trailer park, and Sherrena live in unfathomable luxury in contrast with their tenants. Desmond details one scene where Sherrena and Quentin return from an eight-day vacation in Jamaica to forty voicemails from tenants, including a message from an advocate for the Hinkstons, a large multigenerational family whose toilet, sinks, and bathtub have stopped working. After Doreen Hinkston, the family’s matriarch, withholds $150 of the monthly rent because she paid for the old pipes to be snaked out of her own pocket, Sherrena decides to initiate an eviction for the eight-person family. In another vignette illustrating the stark imbalance between landlord and tenant, Tobin, who takes home $447,000 a year, pays a tenant $20 for five hours of work cleaning an abandoned trailer. Some argue that universal housing vouchers will disincentivize worker productivity; I find solace in the process of educating myself so I can respectfully and knowledgeably disagree. ‘Evicted’ inspired me to imagine new ways I can contribute to the conversation about housing inequity: how can I best support people experiencing housing insecurity and homelessness? How best to uplift organizations working to make sure no person is denied housing? And how do I engage with those who argue that shelter is a not a basic human right, but a privilege that must be earned? These are questions I will continue to grapple with, knowing that housing policy in this country is profoundly broken, but that “a different kind of society is possible, and powerful solutions are within our collective reach” (299). *Note: All names in ‘Evicted’ were changed to protect Desmond’s informants.